I'm sure the question writers get asked the most is: Where do you get your ideas? Well, they come from all over the place, of course. I once wrote an entire novel based on a snippet of information heard on a course at work – and the snippet didn't even make it into the book. This blog was originally inspired by a blog written some weeks ago by Jen Gilroy, who, having been over to her native Canada for the summer, wrote upon her return about old knitting patterns that belonged to her mum, which her mum had written on. One of the comments left on the blog was what a wonderful starting point this would be for a story. So – needlecraft – family – family history – there was the beginning of the idea. The idea was reinforced by my enjoyment of Cathy Spurling's carefully designed family history site, which is always a pleasure to visit, and also by a recent blog about beautiful things by Heidi-Jo Swain, which included a selection of gorgeous photos. Such a happy blog, Heidi-Jo! 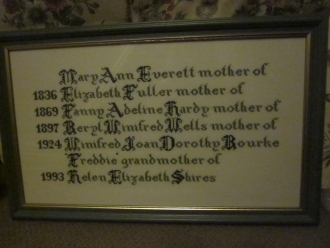 Here is a slice of family history... in tablecloths. This tablecloth was sewn by hand during the War by my mum. Now you need to know that she was the world's worst at sewing. She hated it and she was rotten at it. Trust me – I remember the anguish and the absolute mess than used to occur when I needed help with Needlework homework. And yet she created this. She made it in secret for her mother, copying the design from a tablecloth that was on display in a shop window. She made it against the clock, fearing that the cloth would vanish from the display at any moment. The sewing is exquisite – no one would ever have believed that Freddie, of all people, was capable of producing something so lovely. Her younger sister, Colette, was dragooned into it. In that background trellis effect, there is a tiny green French knot at every intersection, and Colette did all of those. Gran was so thrilled with the tablecloth that she took it to work to show off. A colleague offered her £20 for it – a small fortune back then. Naturally, she declined. Fast forward some forty-odd years and it was my turn to make a tablecloth in secret for my mum. I had always wanted to be able to sew and – with a cack-handed mother and an uninspiring Needlework teacher at school – in the end I taught myself, learning knitting and dressmaking from a part-work magazine, and embroidery from a book of stitches that I still have today. This tablecloth was among the first things I made. It's far from perfect, as I didn't know at that time about separating out the strands in embroidery thread, but my mum was every bit as amazed and delighted as I imagine Gran was all those years ago. My claim to fame regarding this tablecloth is that, on one occasion when my mum used it, she inadvertently lay it upside down on the table, and no one noticed, because the back of my work was neat enough to be able to masquerade as the front. This final tablecloth is just wonderful – a WillowPattern cloth. I'll be honest, I don't know who made it. It was either my late mother-in-law, Marjorie Heron, or else her mother-in-law, Grandma Heron. And if I may be permited a final piece of showing off. Here is the sampler I worked this summer for my niece's 21st birthday. I'm honoured I helped inspire you, Sue, and that you took an idea and made it your own. If each tablecloth you included could talk, I'm sure it would have many stories to tell. That willow pattern cloth is gorgeous. I have willow pattern china! I'm sure your niece treasures the sampler. And samplers tell stories all their own.